4. Schmerling, Philippe Charles (1790-1836). Recherches sur les ossemens fossiles decouverts dans les cavernes de la province de Liège. Liège, Collardin, 1833-34. Schmerling was a Belgian physician and an amateur antiquarian, who liked to investigate the caves near Liège. In 1829-30, in a cave known as Engis, he found three human skulls. He also unearthed the remains of extinct animals, such as cave bears, and he even found a few shaped flints, which looked to him like stone tools. 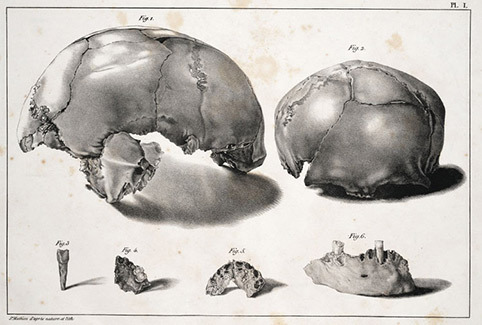 In this publication, he not only illustrated his finds, but he argued that the humans skulls, animals bones, and stone tools were contemporaneous, indicating that humans had lived on earth a long time ago, when extinct animals still roamed the earth. Very few were convinced by Schmerling’s evidence or arguments, and it did not help that he died soon after this book appeared and could not take part in the debate. We now know that the first Engis skull, the one pictured here in two views, was that of an Upper Paleolithic human, while the second skull (not pictured) was that of a Neanderthal child. 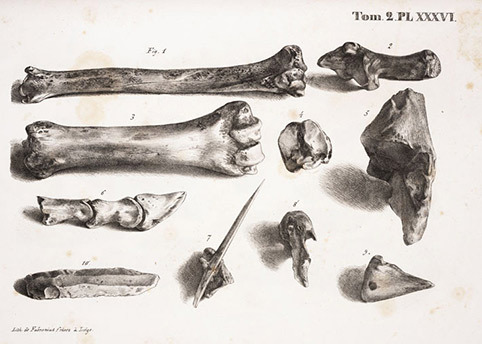 The second plate shows animal bones and, significantly, a single flaked stone tool.